The good & bad of two BB shoe Outdoor quad builds: one 14 years old; other 3 mos. 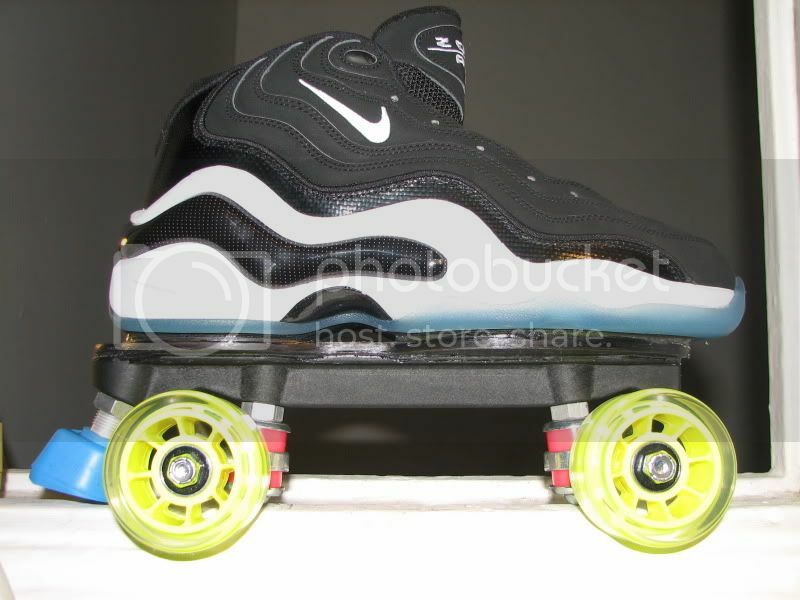 These two pics show two custom outdoor Quad builds (meant for speed/distance path skating) with same Nike basketball shoe but much different plate positioning scheme. The orange stripe skate is ~14 years old - before I knew much about building skates. The 2nd build incorporates what I have learned since then to help make outdoor skating nearly as safe and enjoyable as indoors. Bigger wheels (65-70+mm) will help with this even more, but that is a whole separate post. 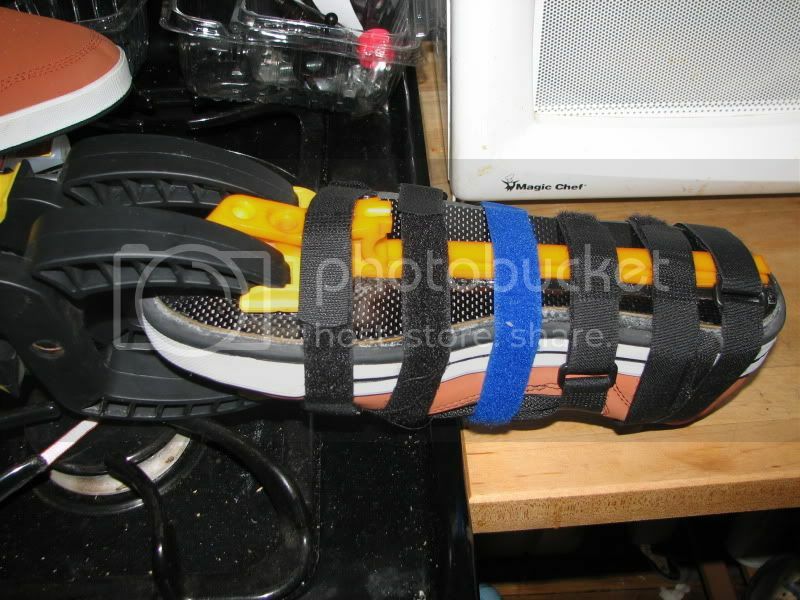 Without going into a lot of detail here, the main differences for improvement are a reverse mounted plate to give a heel brake, a much longer plate mounted more toward the front, and a sole stiffener between the plate and the shoe. 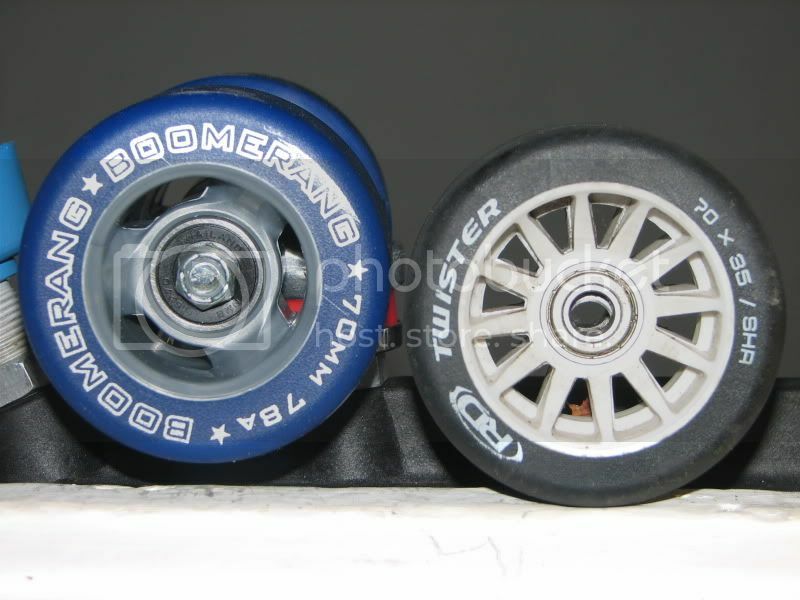 Both builds are shown with ultralight Roll-Line racing wheels, which are not good everyday wheels but are at least big enough, narrow & soft enough (64mm, 35mm, and 83A/80A) to make them good outdoors. With my normal Velocity Race wheels, these Sz. 10 16 oz. shoes are a bit on the heavy side - built to last! Last edited by Armadillo; October 25th, 2009 at 02:29 AM. My Outdoor Quads with reverse mount plates for heel stops work great. My main outdoor skates for this summer have reverse mounted Nova plates and Snyder extra-large stops on the back end. These really work well with 3-5 times more braking than toe stops. The other models of stops I tried were to soft or small and all wore down WAY TOO FAST. The Snyders are more expensive, but well worth the cost. The green stuff is goose poop. For some reason they seem to treat the path as their favorite spot to let loose. Probably think it will slow me down - not gonna happen! I am looking into making stops out of old tires by drilling them with a hole saw and gluing the stack of cut outs with Shoe Goo urethane adhesive. Will post PICS when I have a working version. I have and will continue to be an outdoor quad skater! I think its total retard to pay to rollerskate. I skate for free out my door. And I cant get one derby girl to have the nerve to stop meeting at the rink and skate with me. 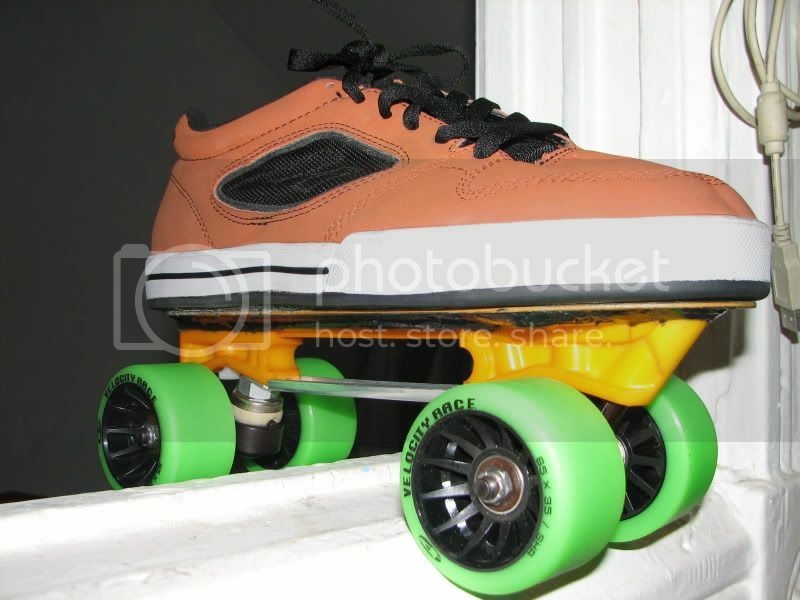 I have the old school soft oak street bauer boot, yellow, with tracker plates I cut down, tracker mid track skateboard trucks and getting soon some abec 11 wheels trimmed down to 35 mm wide and 76 mm tall. 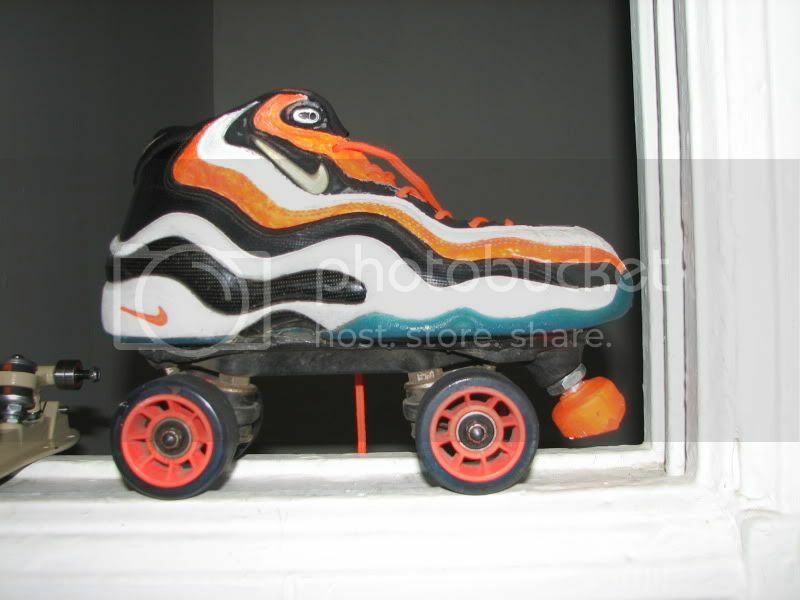 I dont like to talk much about outdoor rollerskates because I got sick and tired of inliners saying you cant rollerskate outside. BS! The secret, put front trucks up to base of toes, can be further up. Longer wheelbase. Yes, skateboards RULE!! I love my rollerskates, more then others can imagine. I also have vert skates, 265s with tracker plates, cockroach wheels, midtrack trucks, UHMW sliders custom designed by me. Also, I'm all for toe stops, yay, all the way!! 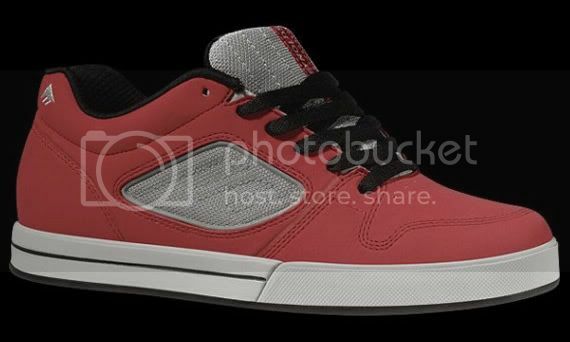 My last two outdoor skate builds have been with these 13 oz lightweight skateboard shoes - Emerica Reynolds Lights. They may look weak for lateral strength, but inside is a strong elastic mesh that goes all the way across the arch and down to the sole, and the tongue sticks up off this elastic band. It really does a good job of keeping your foot centered in the shoe as you push out sideways. are you going to get the flywheels? Which hardness? 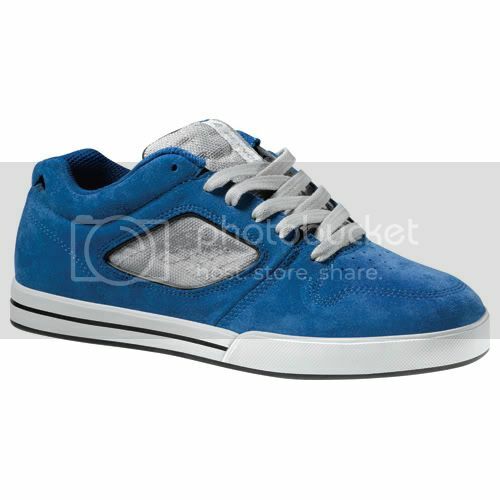 Yes, I should get them soon. Although they have to remove the plate/screws in my arm so might be out a bit. But for now and as soon as I can, I skate outside every day for an hour. I will rollerskate til the day I die!! I'm getting the flywheels 78a I believe. I'm so light, I think the soft wheels will be fine. I am waiting for the guy to lathe them. Since I have skateboard trucks, he is center setting them. Should I stick to 35mm wide or go for 37mm? I dont think he has lathed them yet. He will get them done this week. I'm going to ask for bearing spacers too. I love the kryptos, but they are way heavy. 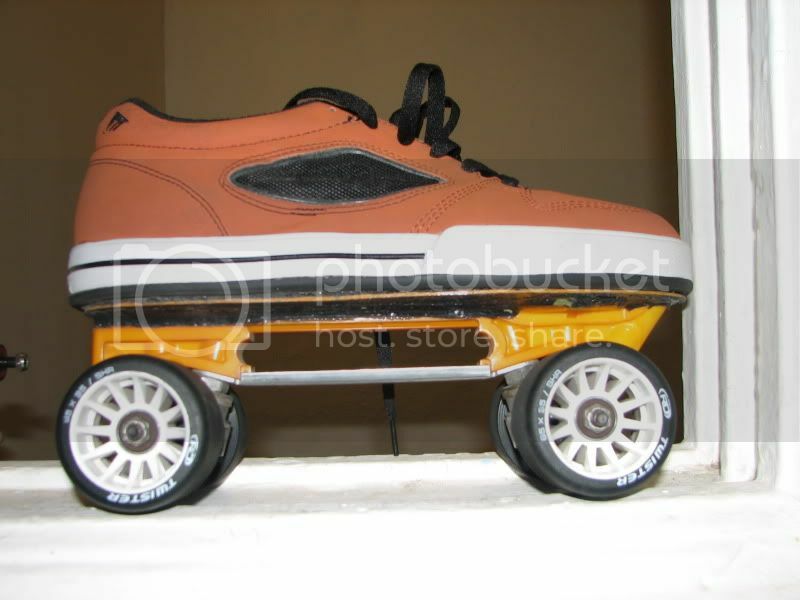 I cant wait for my new wheels!! I'm not sure why more people dont rollerskate outside. Except for hills, I think I'm better on rollerskates then walking. lol. Even just on streets, its the highlight of my day. Outdoor wheels last a long time I find, so the expense turns out pennies over time. Indoor rollerskating is outrageous cost wise!! I'm getting the flywheels 78a I believe. I'm so light, I think the soft wheels will be fine. I don't know. I find 78a is fine for slow casual skating on ruff surfaces, but for everything else the 81a would be better. Unless you are skating on the absolute roughest surfaces, the 78A seems too soft. 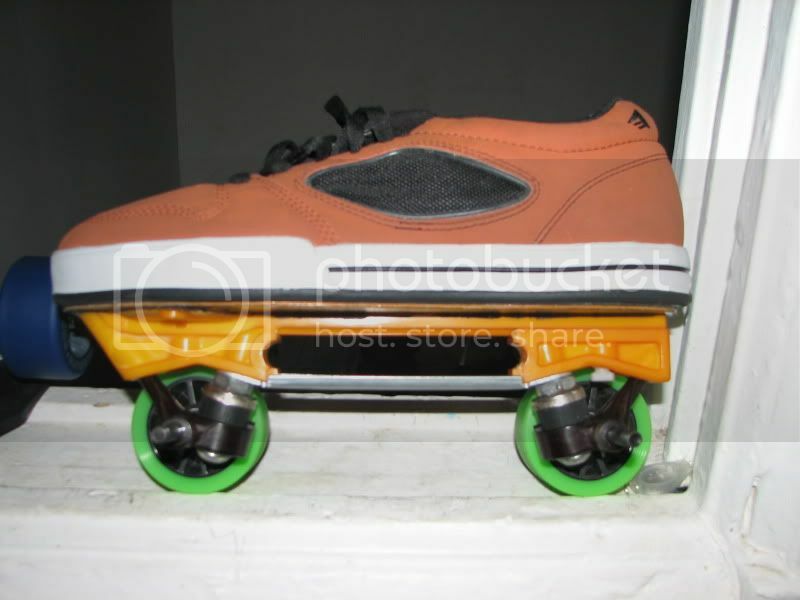 My new favorites are the Twister wheels made by Pacer for Roller Derby. They have the "SHR" rating stamped on the side which means "soft high-rebound". These test at ~83A and have such good roll outside on decent asphalt. They seem just a tad firmer than Velocity Race SHR wheels - and the black is so much better than Kermit green! With 65mm Twisters & titanium threaded axles, this Sz. 10 skate weighs 1164 grams (add 20 grams/wheel more to go from 65 to 70mm Twisters). After steel kingpins swapped for reversed aluminum alloy kingpins & steel slider bar replaced with aluminum triangular tube bar --- 1095 grams. Last edited by Armadillo; August 17th, 2009 at 03:51 PM. I'm sure you both weigh over 100lbs, over 80 lbs? I dont!! I roll always much softer then everyone else. Weight makes a huge difference and yes, I live in a poor area. The surfaces are very rough. I do not pay to skate!! I dont weigh over 80 lbs now so there isnt much pressure on soft wheels for me to make them slow. I always indoors, park, etc. have ridden "too slow" wheels that others say but if I ride recommended, they are WAY too hard. My question was on width? With 65mm Twisters & titanium threaded axles, this Sz. 10 skate weighs 1164 grams (add 20 grams/wheel for 70mm Twisters). After steel kingpins swapped for reversed aluminum alloy kingpins & steel slider bar replaced with aluminum triangular tube bar --- 1095 grams. The Boomerang 78A-70mm are 35.5mm wide & have a decent 44mm plastic hub. 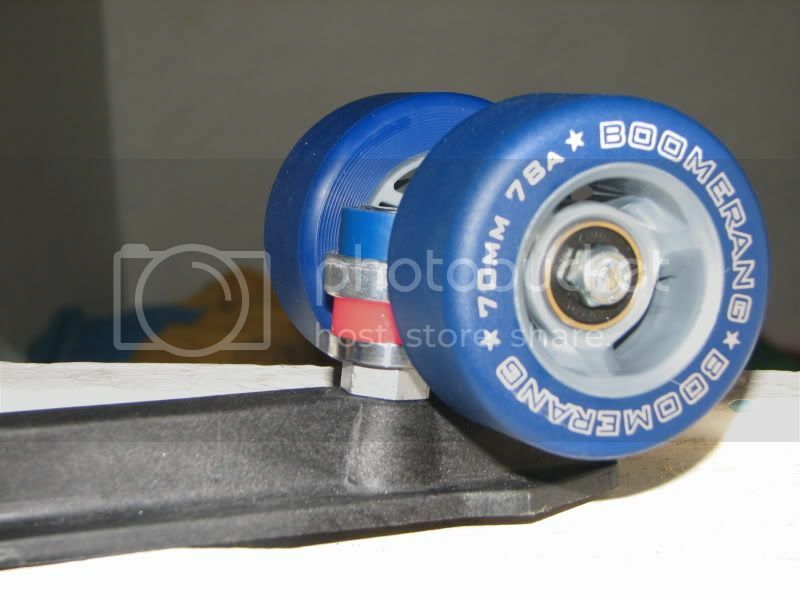 I would let you use my old 65mm 78A VR wheels, but you probably want the 70mm. Perhaps someone has the older softer VRs in 70mm & wants to go up to the new firmer formula? You could take the soft ones off their hands. For your weight the 78a is fine I think. I measured my flywheels and the contact-patch is about 33mm. If you make the wheels centerset, which is as such o.k. you can't use them on other skates, or you wont? Since you are so light, and you are cutting them on the lathe already, why not take these wheels all the way to 30mm narrow? You could just cut a taper out for a few mm from the inner face at the bearing to the urethane OD. This would lighten the wheel too, without narrowing the wheelbase. There would still be plenty of wheel area in contact to handle your lower body weight. The Roll-Lines are already down to 33mm narrow from the factory, so another 3mm is not that much different. What kind of plate will these be rolling on? I like to jump sidewalks and such and used to this set up with my vert skates. One day I'll try to lighten them up with a lighter boots and a ski for the plate. I like these best. I have very narrow heels and always loved the stability of rollerskates. I wont be using these wheels on my other skates. The guy said he could either make them center set or make them like yours, just then the wheels would flair out to the side more and that puts me more likely to clip wheels. I guess one day I'll get a velocity wheel if I have money and use those more so just to speed skate outside. I like to go on all surfaces and not be limited in my skating. I honestly dont care if I go a second faster or not as there is noone for me to compete with anyways. I think I'll stick with 35 as he is putting a small radius on them too. Will you thin your wheels at outside, inside, or both sides? Is that Shoe Goo? Does gluing the plates on really make a strong enough bond to handle aggressive outside skating? How long do you expect a pair of skates like this to last? Center set so that means both sides. My trucks are wide enough. I like the skateboard trucks because I can skate fast and no speed wobbles, plus very stable for landings. 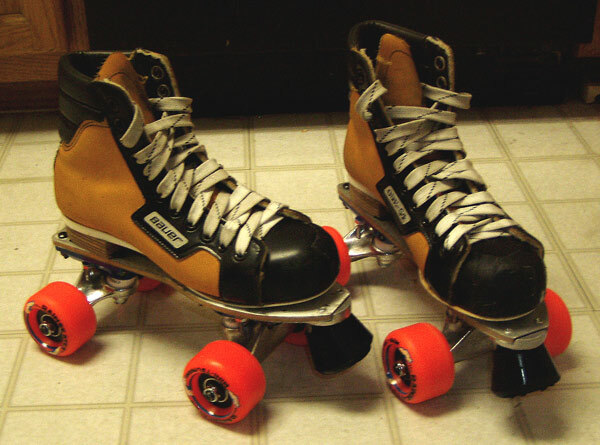 I want to give my indoor speed skates a try outside but since those have skins on them, sure the action is too reactive for a good outdoor skate. Urethane Glued skates last more than 10 years. These are nearly 14 years since glued. Only wheels & stops changed. This plate was switched from urethane (in PIC) to Gorilla superglue (rubberized edition). Front was left glued with urethane - Shoe Goo. Because slider bar contact area was so slim and truck hanger puts a lot of leverage on glue without a mount bolt, I switched to superglue for a much stronger bond from plate to carbon fiber. This is why a carbon fiber sole adapter is critical for a good result. It bonds BOTH to uneven sole with urethane and to perfect, no-gaps plate joint with superglue. Now there is NO SEPARATING them. Last edited by Armadillo; July 29th, 2012 at 09:48 PM. GLiB, what are you referring to as far as aggressive outside skating? Because honestly, I do not know of an aggressive type of rollerskater that has skates like Armadillo. 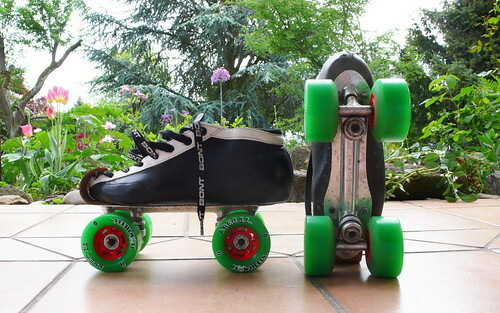 Heavier shoes, toe coverings, usually wider trucks, also sliders and bolts are used by aggressive type skaters. 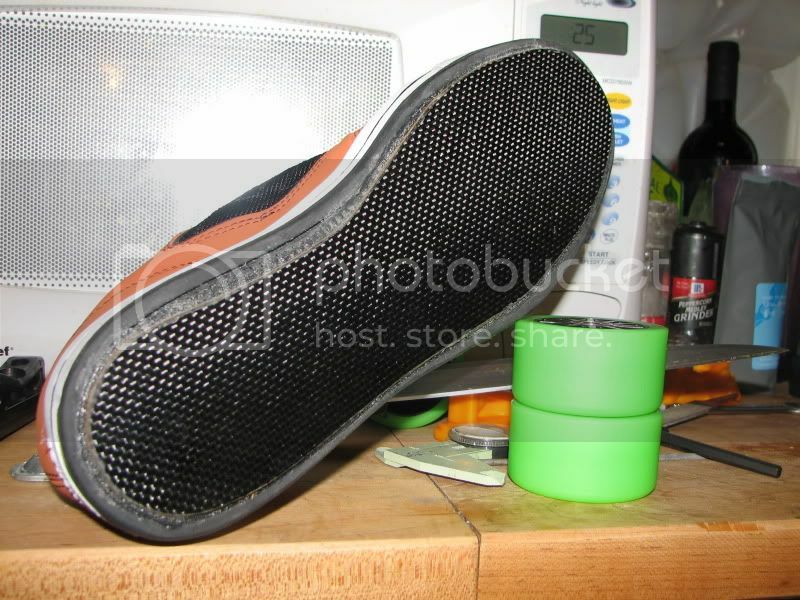 I have never glued a plate to a shoe as toe slides wear them down and I cant afford to replace plates. Boots usually wear out first. But for outdoor street skating, a plastic plate, lighter boots, etc. all work well. I'm sure glue would work too with fitness type of skating even though I wont do it that way. I dont think with my type of skating the boot would last 10 years lol.